Bromelain is a naturally occurring enzyme complex found in pineapples. It supports protein digestion. It supports reduced inflammation. Even if you only have one reason to use it, you will benefit from the other. Bromelain is used in many herbal formulas but now you can get kosher certified bromelain all by itself. 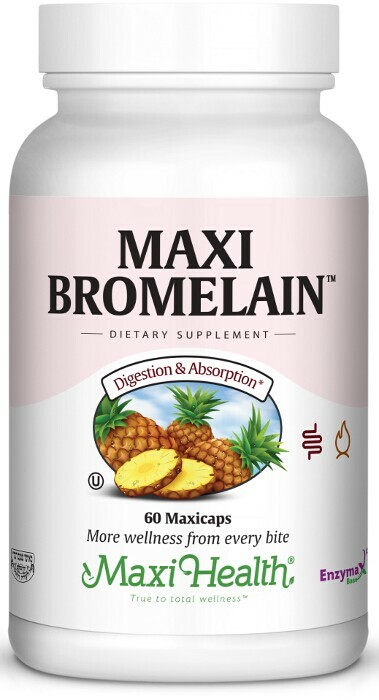 Get Maxi Health Bromelain today! Take two (2) or more Maxicaps™ daily, or as directed. Other Ingredients: Vegetable cellulose (capsule), vegetable magnesium stearate, microcrystalline cellulose, Enzymax® (calcium carbonate, bromelain, papain, lipase, amylase, protease, silica).